For a reference list of several of our customer comments, feel free to visit our Diamond Certified Survey. See the Diamond Certified Logo at the Bottom of the home page and click on the sentence underneath that says “read what our customers have to say about us”. Ed and I wish to thank you and Mary for your wonderful kitchen design and all of your assistance along the way. We love our Dura Supreme cabinetry as well as the Cambria counter tops. All products have been a joy to admire and use daily. We also wanted to let you know how pleased we were to meet and select Joe Williams Construction to install the cabinets, making sure that the quartz was properly installed as well as the fixtures we selected. It was a true pleasure to work with Joe and his colleague Jeff Moroni. The job progressed well and it was interesting to see everty thing be installed to create our beautiful kitchen. Again, our thanks to Kitchens by Ken Ryan and Joseph Williams Construction. I want to take this opportunity to express my most sincere thanks for helping me create, and complete my total kitchen remodel. Your vision surpassed my expectations. I truly appreciate your kindness and your integrity. You were always there to offer guidance without pushing your opinion. I am so pleased with all of my selections. It really turned out beautifully. Ken, you and Mary make a truly great team, and one I will be more thank happy to recommend (and already have). You’re always there making sure everything is right. Please feel free to have any potential customers call me. I’m happy to sing your praises. It is easy to understand why you are Diamond Certified. When they called me, I gave them a 10+. You go out of your way to give top shelf service. Testimonial By Kathy and Dave. It was such a pleasure meeting you and working with you to create our new kitchens and family room space. We are very happy with the results. Your expertise, craftsmanship and communication skills made every aspect of the planning and construction phases a positive experience. We have been touting you work among our friends and you are welcome to use any part of this message as testimonial in your advertising. We would be happy to speak with prospective customers. I am sure that we’ll be seeing you around town and at the office. We were so happy to find such a reliable business right here in Novato. I wanted to drop you a note thanking you and your team for all the help with our new kitchen. This is our 3rd remodel in the past 3 years and by far the easiest. We used the big box stores to remodel 2 of our rental homes but we wanted a “custom” look for our home. I’ll never go back to a big box store after my experience with Kitchen by Ken Ryan. Kelly and I have high standards and tight budget constraints which is a tough needle to thread. We spent years trying to find a kitchen design that met our needs. We got designs from major big box stores, contractors, local hardware stores and even a high end designer. The high end designer wanted $ 160,000 to remodel our kitchen – that still makes me chuckle. When we walked in your store I was expecting a repeat of our experience with the high end designer – was I wrong. You nailed the design. It was perfect. We love our new kitchen. Cheap cabinets will always look cheap. The big box stores always quote you a price for cabinets without any upgrades. By the time you add the bells and whistles like lazy susans and pull outs your prices are very competitive. When it comes to service, however you leave everybody in the dust. I remember calling you during installation with a question about the sink placement and instead of trying to explain your answer over the phone you dropped everything and drove out to the job site. Try that with home depot. My labor costs at the job ran about $200 per hour. That can add up real quick waiting for answers. We can’t thank you enough. You definitely earned your diamond rating. First, let me apologize for taking so long to write this letter and to say that the delay does not in anyway take away from my gratitude. We have lived with the new kitchen for several months now and could not be more pleased. I can hardly remember the original one and can’t believe we put up with it for so long!! My neighbors are truly envious and I think regret some of the work they had done, they should have used you, Gold Hammer Construction and California Granite. The three of you make such an awesome team. I am so grateful that you persuaded me to use these companies for my kitchen remodel. Because the three of you have done so much work together it really made the whole process almost seamless and definitely less stressful for me. I really was not looking forward to remodeling because I had heard nothing but complaints from friends and neighbors about how it always took much more time and money than the original estimates. That was not the case, in fact both Gold Hammer and California Granite took less time than expected. I must say that in addition to doing a fantastic job, the guys that worked in my home could not have been nicer. They arrived everyday on time (often early) and were gone at a reasonable time every evening, leaving the work site amazingly, somewhat unusually clean for a construction zone! The attention to detail really shows in the final product, they did an amazing job with the construction of the island and placement of cabinetry. It was such a pleasure to have Michael and Quinn working in my home, I really appreciated their expertise and recommendations. I was actually a little sad to see them go when the project was completed. 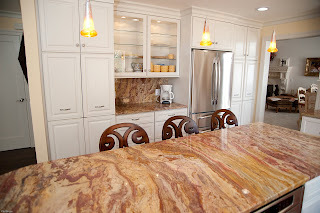 Everyone that sees the kitchen loves the granite and is so impressed with the flawless installation. from the actual placement on the stones to the perfectly matched edges and single seam install, the finished product is absolutely beauttiful. Dave’s expert advice saved me from a potentially expensive mistake. I am looking forward to working again with Dave Walkup when we are ready to remodel the bathrooms and replace the tile around the fireplace. Lastly, I really have to thank you for your endless patience, professional guidance and knowledge of the industry. Working with you was a pleasure, you deserve some sort of award to sticking with me on the now famous island problem. I think at times both of us were ready to give up because it was such a challenge to make it work the way I wanted and still be able to pass inspections. Thankfully, we persevered and I now have a really beautiful, functional kitchen that I absolutely love to be in. I really appreciate all of your guidance throughout the entire process and for doing such an incredible job of coordinating all the various people involved. I can say without any reservation that I would highly recommend, to anyone considering a kitchen remodel, that they use your services. In addition, I would use both Gold Hammer Construction and California Granite for future projects and would recommend them to everyone. The knowledge, expertise and resources that were available from all three of your companies was invaluable to me as a novice and made the experience a very positive one and not at all what I had anticipated. I just wanted to share our experience in working with Ken Ryan and his team in the remodel of our condominium in Cow Hollow in San Francisco. 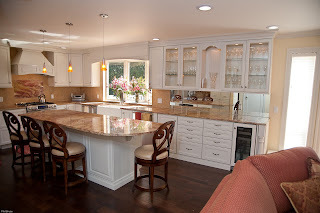 Ken is a terrific collaborator and understood well our interest in a classic, traditional kitchen, including flush-frame cabinet doors and drawers. He organized the subdivision and assembly of the cabinets to minimize joints between sections; the result is a clean, seamless appearance. The kitchen involved a tight layout in an existing 1920’s building, with uneven floors and ceilings, and Ken anticipated key details involving counter top edges, a flip-up door and a flush refrigerator enclosure. When there was a question on how to resolve a design issue, he always took the initiative to reach out and have a conversation about proposed solutions. I look forward to working with him again on future projects and can recommend him unconditionally. “Our new kitchen is simply beautiful and the Plato cabinetry we selected is what sets it apart from other high-end kitchens we’ve seen. It’s great to look at the finished result and feel like we made all the right decisions and one of the best decisions we made was to work with you. 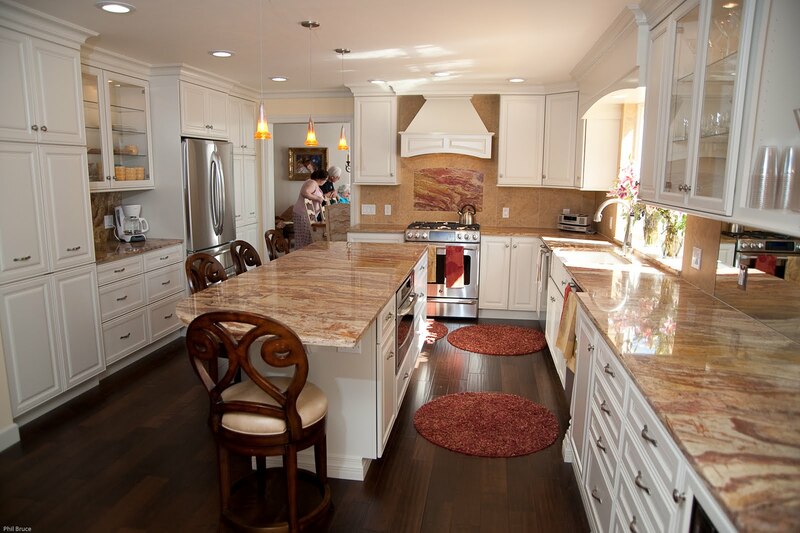 We were referred to you to look at cabinets, we never imagined how large a role you would play in our remodel. Your patience, attitude and attention to details not only resulted a great kitchen, but made the remodel process a pleasant one. 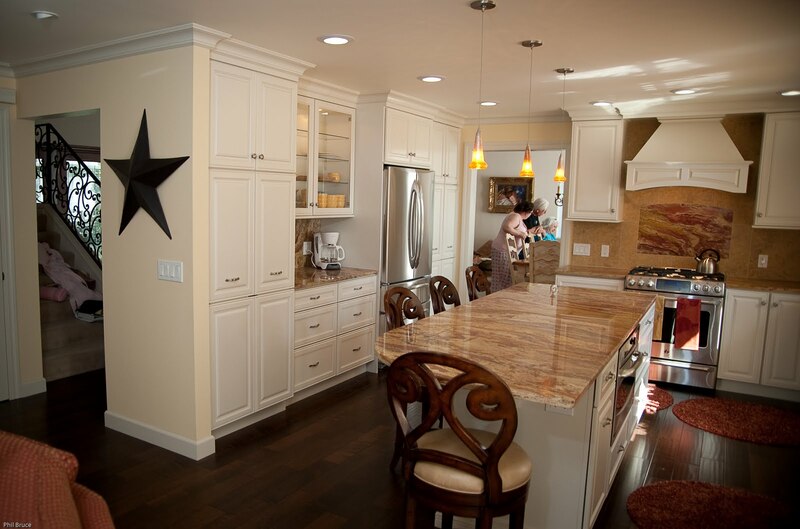 As you found out, we had little experience with remodeling and very high expectations for this kitchen. You certainly rose to the challenge by turning our ideas into reality, steering us in the right direction when needed, and always having ideas when a problem arose. It was amazing how many small details needed to be managed in order for everything to come together perfectly in the end. Eileen and I would like to thank you all of the numerous favors you did for us, as it significantly reduced the amount of time we had to spend on the project. We also noted how your working relationship with our contractor positively affected the project. The entire team left us with the impression that job wasn’t done until we were 100% satisfied. We are!